I recently spent two weeks tracking my calorie intake, calorie burn, exercise and pretty much every aspect of my lifestyle for a fortnight. What was more surprising than my own personal experience was seeing how others reacted. From just a few social media shares alone, people contacted me on Facebook, singing the praises of tracking everything they do, saying it was the only way they had achieved fitness goals and weight loss success. Others said the exact opposite, that just the thought of tracking calories made them feel anxious. And some even got in touch with me privately and said that tracking calories had been to blame for long bouts of obsession with food and even eating disorders. The big question is why, when many of us are armed with the same knowledge, access to the same research and the same pieces of tech do we have such different attitudes to tracking and such different stories to tell about our experiences? The first and most obvious port of call, is what apps and tech people are using to track their calorie intake, calorie burn and exercise. You could say that armed with an app that has a calorie database and a wearable that can track your runs you've got just as much luck at using tracking to your advantage as the next person. But that's not always the case. We've seen a huge proliferation in activity tracking tech here at Wareable. But there are all kinds of things that can affect people's experience with specific devices. We spoke to data science consultancy Profusion's CEO, Mike Weston, who told us there are so many factors at play in how successful a wearable tracker will be for a user. These include poor battery life, whether the wearable makes tracking easy for the user and design. If you don't like the look of a tracker, you won't wear it. However, Weston argued that setting aside these factors and assuming tech is advancing all the time, the real challenge is how we can get anything meaningful from the data we collect. "Wearers can be unsure about what to do with the information they've collected," he told us. "This is another reason why some people do not get on with tracking in the long term. "The data can lose its value if it doesn't have any context. A wearable that can tell you how to improve your health, how to increase your stamina or decrease your lower back pain would add a whole new dimension to the user experience. By adding in complex information about how your fitness regime compares to people in the same profile can also make it easier to determine what you should be doing to stay healthy." For Jawbone, it seems that advanced sensors are important in ensuring people stick to tracking, but it's more about the ecosystem. "Our job is to help people make sense of the data they are tracking – to understand it, to know what to do with it and how they can change their lives," said Jawbone's spokesperson. Knowledge about nutrition and food is also a key factor. For instance, Jawbone's data shows that users who tracked the food they ate everyday had a more significant amount of weight loss than users who just tracked activity. I spoke with Polly*, who lost a significant amount of weight using wearable tech, about her experience and she told me that it was a case of trial and error. "At first I didn't enjoy using MyFitnessPal and my Fitbit. I wasn't hitting goals and felt like I was failing spectacularly. "But what it made me realise over time was that my ideas of what was "healthy" were totally screwed up! So although it took some time, this focus on tracking actually made me realise that I needed to learn more. So the more I tracked, the more I learned in my own time. I was taking tidbits from what my apps were suggesting and actually advancing my knowledge further." Those who logged their food regularly began to learn more about what they needed in their diets. These users ended up logging 25 percent more fibre, 13% less fat, 13% fewer calories and 12% less sugar than those who did not lose weight. Although it's a small sample size, it points to the quantifiable benefits of people becoming more educated about nutrition. 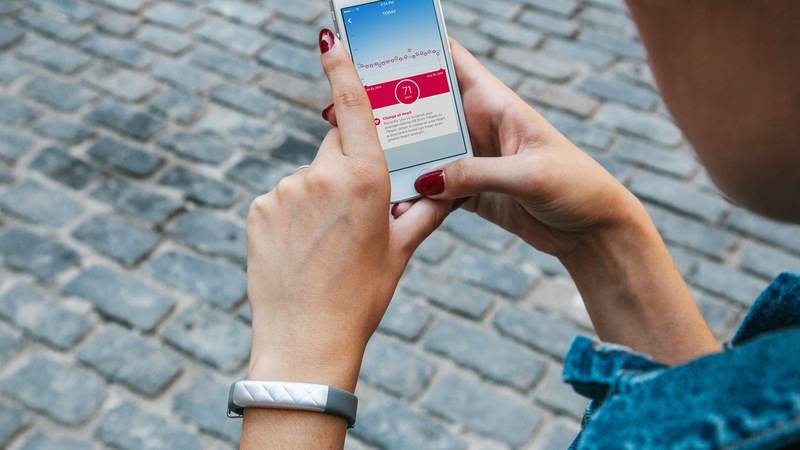 Or the potential for systems like Jawbone's Smart Coach that help people to become more healthier and more educated. Can awareness lead to change? It's one of the biggest ideas thrown around by wearable tech and quantified self companies. That simply tracking what you do and becoming more aware of it can bring about behavioural change. It's actually a very old idea based on Eastern teachings that something can no longer hide if you bring it into the light. And it's definitely something most wearable tech companies build their brands on. More from that Jawbone food logging data: "One of the biggest differences between people who did and did not lose weight was the number of meals logged per week: people with major weight loss logged 75% more meals per week than those who did not lose weight. "This supports evidence from other studies which show that keeping a food diary is one of the best long-term strategies to help people lose weight and keep that weight off." Profusion's Mike Weston believes that by tracking and increasing awareness you're getting rid of the emotional barriers that may have previously been in the way. "A lot of the approach to healthy eating, exercise and fitness can be based on emotion," he said. "By putting a number on what you're doing, tracking it over time and perhaps adding a competitive edge, it can make it easier to stay motivated." Our attitudes to health and fitness can be emotional so why not strip this out in theory of data? Well, it sounds good in theory. But eating, habits and what makes us tick is all inherently very human and very emotional. Can we really detach the two? I'm sure plenty of people would love to play a numbers game with their food and could excel at it. Others aren't able to. In fact, for various reasons, it can have extremely negative consequences. I spoke to Sarah*, who says she became obsessed with food after tracking every workout and meal. "It was reducing everything down to numbers. I realised I was thinking about numbers all the time. Less about experiences and what I was actually doing in the moment. "For me it became a numbers game and every time the numbers didn't add up, I became more and more disheartened. I'm actually glad I realised this in time. Because it was making me feel down in other areas of my life as well. It's actually taken me a while to get over the whole adding up game." "I believe that many people set themselves up to fail, by trying to adopt a methodology say from business or project management into something that is not as rigid," said life coach and clinical hypnotherapist Michael Carthy. "What's required if you want to make real, long-lasting and effective change in any area of your life is a flexible growth mindset. And in this case it'd be based on healthy, mindful eating, adopting the 80/20 rule and less on ticking boxes, counting calories, reaching goals and an obsession with data." A fixed mindset, which means you want to look smart and good. You avoid challenges, give up easily, see obstacles as catastrophes, ignore criticism and feel threatened by the success of others. Or a flexible growth mindset. This is all about wanting to learn, find out more, embracing challenges, persisting in the face of setbacks, seeing effort as the path to mastery and learning from criticism. That's a basic distinction but essentially the more you can adopt a flexible, growth mindset the likelier you are to achieve your goals, grow, learn and be happy while you're doing it all. The question is whether quantifying our lives gives us much room to be flexible, to not hit goals, to leave room for and learn from failure and persist in the face of setbacks. Or whether it's actually pushing us towards a fixed mindset. So the tech needs to look good, be easy to use, data needs to be meaningful and our mindset needs to be flexible. Would it be too reductive to develop a criteria that for both users and wearable tech companies? "It seems that success is determined by meeting at least three of the criteria," he said. "Fun seems to be particularly important. The example of Foursquare is telling, where gamification provided the fun element for certain people. For others, the fun is intrinsic to tracking, whether or not the tracking service itself has gamified the user experience. Specific and positive objectives, for which monitoring provides feedback, provide further criteria for maintaining QS activity." Wearable and connected tech has often turned to gamification to improve habits, from Fitbit badges to MyZone's points to PlayBrush's tooth brushing games. And Guest's criteria certainly stand up when you read success stories which refer to a mixture of mindset, good tech and being focused on the right outcomes. It's also great to see him mention fun. I can't help but think a big part of the problem for those who struggle to make progress is relying on data and metrics to make the changes for you. Eating, keeping fit, making habits, motivating and enjoying yourself - that's what's really human. *Both of my case studies were happy to share their stories for this feature, but wanted to remain anonymous. So these aren't their real names.